Powered by 4- and 6-cylinder engines with optional all-wheel-drive, the Ford Fusion combines unique looks and an inviting interior with sporty, yet comfortable handling. 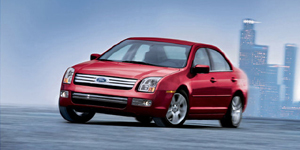 For 2008, the Ford Fusion adds standard ABS and a tire-pressure monitor, while the navigation system adds voice activation. Optionally available are a rear obstacle detection and Ford's Sync communications and entertainment system. An optional Sport Appearance Package comes with a firmer suspension and sporty interior and exterior styling cues. Find the used Ford Fusion of your choice from a dealer in your area. Search our used car listings now.